My mom came back from a recent trip from Africa and brought back a sample of a dressing she loved. She asked me to replicate it, with her help, we were able to get really close. This is a recipe for a very nice spicy lemon dressing that can be used on a simple tossed salad, to brighten up sauteed vegetables, pasta and pasta salads. My mom is one of the best at making salad dressings, so if this is one of her favorites, then I know its good.. and it is. 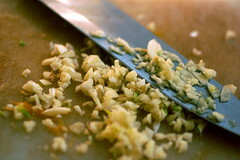 Finely peel and mince both the garlic and ginger. You can chop it as fine as you can, then create a slight paste with it by sprinkling a few grains of coarse salt on the ginger/garlic and take the edge of your knife and press and slowly slide against the garlic and ginger. Do this for a few passes and you will have a something resembling a paste. Doesn’t have to be even remotely perfect. in a glass jar with a lid that can hold 2 cups of liquid (preferred, but you can use a bowl and whisk or plastic container with tight fitting lid), combine all of the ingredients. Then shake, and shake some more to combine all. Open and taste. Grab a piece of lettuce and dip and taste. It is best to let sit at room temperature over night, but at minimum 3 hours before adjusting seasoning. If to strong in vinegar or soy sauce, add more oil 1 TBS at a time. If not enough acid, add more lemon juice or vinegar 1/2 TBS at a time. If not hot enough – add more hot sauce or crushed red peppers. That is it. Simple and very tasty. Important note, why is room temperature better than putting it in the fridge over night? Instinct tells us we need to put it in the fridge. However, doing so will cause the oil to solidify and slow down the process of allowing the flavors to interact and come together as wanted. This is true for all salad dressings. Once it has the flavor you want, then by all means keep it in the fridge for up to 2 weeks. Just give it some time out of the fridge for the oil to loosen. If in a rush and you have solid-ish oil, remove all metal and by all means put in the microwave for 5 – 10 seconds. Then shake and shake again. I did not take a picture of the dressing before sending it off to my mom, so you will just have to go by taste. If it tastes good to you, its good. Posted by culinaryease on August 25, 2011 in Cooking for two or less, General Cooking, Parties, Appetizers, and More, Recipes, Vegan/Vegetarian and tagged Asian, dressing, Lemon dressing, PostaWeek2011, Salad, salad dressing, Sesame oil, Soy sauce, Spicy, Spicy Dressing, Vinegar.